Ravi Shastri has said in recent interview that Little master Sachin Tendulkar, should be allowed to pick and choose which matches he would like to play in. Tendulkar opting out of the Twenty20 match in Sri Lanka, Shastri said "Tendulkar knows his body better than anybody else. He has realized that Twenty20 is a young man's game. He feels that he can prolong his career and add value to India as a Test match player and by playing only in the important one-day tournaments and series. Sachin has realized that he has reached an age where he has to look after his body and see where he can give optimum value to India. It is good that he has decided to give a younger player a chance and at the same time ensure that he is not burnt out. 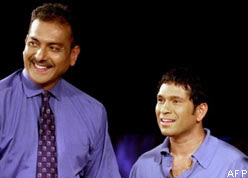 Shastri is hoping that Tendulkar will play in the 2011 World Cup. Tendulkar must play as much Test cricket as he can and play in only the big ODIs like the World Cup, Champions Trophy and against strong oppositions where his contribution is needed. Shastri is on his way to New Zealand as a commentator for the India tour said the New Zealand tour will be a big challenge but this Indian team has it in them to turn things around. They have got the right blend of experience and a mixture of caution and aggression. They have some real aggressive cricketers. It is nice that they are starting with a one-day series and whenever India has started a series with a one-dayer they have done well.